By GreenEyedLillies on June 15th, 2008 . Filed under: Accessories . 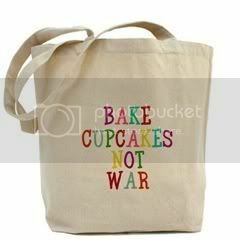 Ridiculously cute, canvas, printed tote bag states “Bake Cupcakes Not War” The perfect sized tote bag for well, ANYTHING! Knitting, recycling, kids toys, overnight bag, school, yoga, Pilates, oh and of course, grocery shopping… Buy a couple and use instead of plastic bags at the grocery store, keep one in the car to hold junk, blankets, or other stuff, pack an extra one in your luggage if you plan to over-shop, heck, use it as a diaper bag like I do! Our 100% cotton canvas tote bag includes a bottom gusset and extra long handles for easy carrying. Image is on both sides. Available at The Silly Wagon.